‘Game of Thrones’: What’s the Letter That Arya Found? What’s the Deal With That Letter Arya Found on Game of Thrones? Sunday’s Game of Thrones was a trip down memory lane: From Jorah’s reunion with Daenerys to Gendry’s surprise recruitment in the war against the White Walkers, “Eastwatch” dug up all sorts of long-simmering story lines ahead of what looks to be a major battle in next week’s episode. 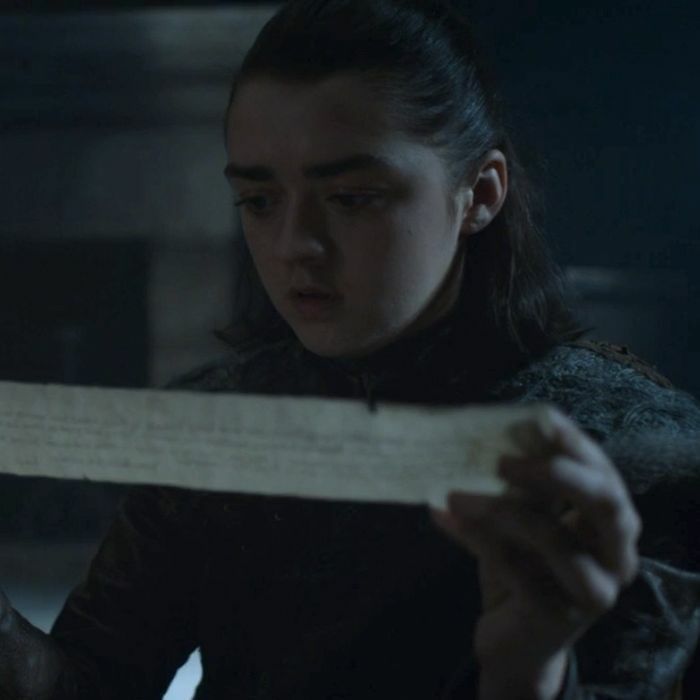 But one particular moment might’ve had you scratching your head: What was that letter that Arya found in Littlefinger’s room? Of course, a simple conversation with Sansa would clear up all of this letter confusion — not to mention how it’d put Littlefinger on the fast track to his well-deserved comeuppance. But that’d only happen if the Stark sisters can actually sit down to have that kind of chat. Good thing Arya isn’t known for making hasty decisions based on gut instincts, right? What’s the Letter That Arya Found on Game of Thrones?